Fortune Soya Plus Health Oil contains zero cholesterol and helps maintain strong bone and good vision. 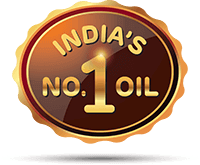 Rich in 'Omega 3', our healthy cooking oil gives your body the essential fatty acids and keeps your heart healthy. Ghar ka khana, ghar ka khana hota hai! Ab ghar ka khana hoga aur bhi sahetmand!